AUSTIN, Texas -- Former Chicago Bears running back Cedric Benson was ordered Monday to install an ignition-lock breath tester in his car after he was charged with drunken driving. Benson was charged in separate incidents of boating and driving while intoxicated. Travis County Court-at-Law Judge Elisabeth Earle ordered him to install the device within 72 hours as a condition of his bail at a pretrial hearing. The device prevents the car from starting if it detects alcohol. Earle said the ignition lock requirement is common for defendants facing multiple DWI charges and does not indicate whether Benson is guilty or innocent. 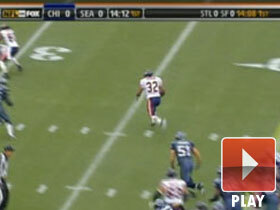 2007 Highlight: Cedric Benson runs 43 yards for a touchdown. Benson's attorney did not immediately return a telephone message seeking comment. On May 3, the former Texas star was charged with boating while intoxicated on Lake Travis and resisting arrest. A few weeks later, he was charged with driving while intoxicated when he was pulled over in downtown Austin. The Bears cut Benson after the second arrest. Chicago drafted him in the first round in 2005.